What is CRR and Repo Rate - How are they Helpful ? Today we will see what is CRR and Repo rate and how they help in combating Inflation and other monitory issues of Economy. CRR and Repo rate are nothing but the tools available in the hands of RBI to maintain the liquidity and growth. You might know what is CRR and Repo Rate, but may not know what is there significance and how they help. Read whole article to understand. What is CRR Rate ? Each Commercial Bank has to keep certain percentage from their deposit amount in the current account with the Central Bank of India i.e. RBI. This amount is called as CRR i.e. Cash Reserve Ratio. It is the ratio of deposits which banks have to keep with RBI. Banks do not have access over this amount for any economic or commercial activity. It means Bank can’t invest the whole deposit and they can’t use the CRR money for any lending or investing purpose. Let’s see an example – When you deposit Rs.100 to your bank, bank gets Rs.100 and now can use this money to lend others, but they have to put some part of it with RBI, if CRR is 8%, they will have to deposit 8 with RBI and they are left with Rs.92. 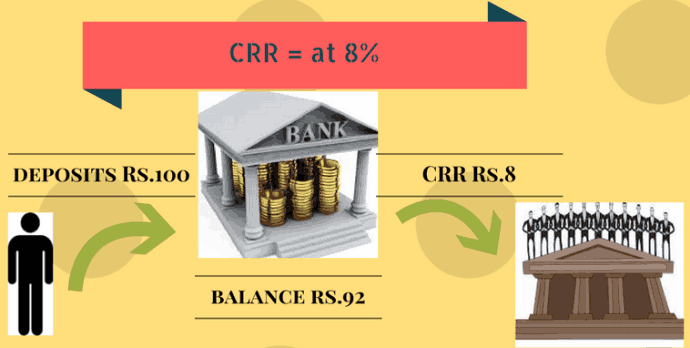 So when CRR is decreased, Banks are left with more money to lend and when its increased they are left with less, even though 1% decrease in CRR leaves bank with 93 instead of 92, this Rs.1 is big enough thing. When we need money, what do we do? We take loan from particular bank. And when we pay back that loan bank charges some interest on principle amount. This is called cost of credit. Similarly, when banks need money they borrow it from RBI and the rate of interest which RBI charges on that loan on Banks is called Repo Rate or Repurchase Rate. So if repo rate is 9%, and some bank takes loan of Rs.100 from RBI, they will pay interest of Rs.9 to RBI. This is a short term loan i.e. upto 1 to 2 weeks. Higher the Repo Rate higher the cost of short-term money, Lower the Repo rate lower the cost of short-term money. This means at higher Repo Rate the economic growth will slow down and at lower Repo Rate economic growth will enhance. How is Repo Rate linked to the interest we pay for loans from Bank ? Simple, Banks need to charge more interest than they are paying, so if repo rate is 8%, they will charge more than 8% for loans which they give, If Repo rate comes down, banks’ may also consider the interest rate they charge us. That’s the reason why with this latest Repo rate cut, people are talking about home loans rates coming down, so what will happen is that Bank need to pay less interest for the loan they take from RBI, now because they are paying less, they may think of charging us less on the interest for the loans which we have taken from them. How does money get created? When A gives 100 to B, Rs.100 is created for B , then when he gives this to C, 100 is again created for C, this way money creation happens for different people from that same 100. How does CRR help ? Suppose CRR is 8% you had 100, which you deposit to bank, now bank will Deposit 8 to RBI and lend this 92 to some one, This 92 will be another money which is created for someone, now this 92 will exchange hands and then come back to bank somehow, out of this 92 again bank will deposit 7.36 to RBI and then lend the rest of it to someone … and it goes on like this. It means that this 100 actually generates 1250 in the economy indirectly. What will happen if CRR is increased by 1%, from 8% to 9%. though it may looks like that this is a small change and it would affect a lot. Lets see what happens now . . .
How much money will 100 create now? So the same money is now generating 1111 instead of 1250, that’s 139 less or 11.12% less money in the market. How does Repo Rate and CRR help to ease Inflation? When Repo Rate increases, the banks have to pay higher interest to the RBI and thus Banks also charge higher rate of interest to the common public who borrows loan from bank. Due to this people gets discouraged to take more credit from banks, because of which there is less supply of money in system and there is less Liquidity. So on one hand Inflation is under control as there is less money to spend and on other hand growth will slow down as companies or people avoids taking loans at such a higher interest rate. It’s easy, if CRR is increased, banks have to deposit more money with RBI and banks will have less money to invest. So now bank will increase the interest rate on the loans which they will lend to other people. People will avoid taking loan because of higher interest rate and it results in less money creation in economy, and hence people have less money to buy things and they will think twice before paying higher price for something. Due to this prizes will fall because of low demand. Tnx for the article. Understood 2 new terms fully. CRR and REPO rate. Tnx again Manish!!. How much currency should be there to avoid black marketing? This week the bank has reduced the CRR by 25 Basis Points but not the Repo Rate and so many people are criticising this decision…i want to know what is the difference between Increasing the Repo Rate and CRR………..are not these two tools the alternative?? sir i want to know about bplr and some abberviations how they related to banking sector pls can you provide softcopy to my email regarding to abbervations. if clr,slr,rr,rrr are increse or decrease what will happen in banking sector. I knew about CRR, Repo and Reverse Repo from last 2 years, but never made an effort to understand their play and use in the economy. You have explained it in a very lucid and brilliant way. Now I can bet that I am not going to forgot these term ever. Nice .. that says that I wrote it in the right way ! I get to know how a little change in CRR & Repo rate affects liquidity acc. to Money creation concept. Good to see that you learnt something ! thnx 4 the info on crr n cash repo. would love to know a bit on slr and bank rate and reverse repo rate. it would great if u touch these topics 2 for better understanding. How it can control food inflation ? Even there will be less money in market due to increase in CRR but people will still buy food to eat. they have to buy n thy won’t think twice. Is bare mei pada bahut tha, but funda ab jakar samaj mei aaya hei. Ab is concept ki nabj pakad mei aa gayee hei. Nice Manish, but the discussion will be incomplete if you do not touch SLR and Reverse Repo simultaneously. Also, one more question may come to mind is if out of Rs 100 deposit banks put, say, Rs 8 with RBI and lend Rs 92( which they do not do due to SLR) then what is the need to borrow money from RBI @ Repo. Banks some times need short term debt like 1 day or 2 days , then they take it from RBI , then reverse repo rate comes into picture . I dont think SLR comes into picture anywhere here , Its just a ratio of deposits they need to have as liquid deposits so that there is no liquidity issue . thanks a lott manish…due to this i hv learnt a lott bout all this…nd it helped me in my presentation also..
Good to know that it helped you in your presentation and thansk for leaving the comment ..
thanks a lot your explanation help me a lot in my presentation. Thats a good point you have brought up, we alwayz think to ourselves “Why would bank decrease interest rates if an individual ask, bank is such a big entity they wont care” But the point is if many are knowledgable about such factors such big entities would be on their toes. It may happen that repo rate is decreased significantly , but people who have taken home loans will not ask there banks why they have not slashed the interest rates for loans, because of this ignorance banks may delay the lowering of rates and hence benefit monitorily from the delay .